Toxy.de Main page » Components, spares & accessories » Wheels & tires » Racing Tire 20" Durano plus, foldable. New 2014 tire. Foldable 20" Racing Tire "Durano plus" (28-406/20x1,10). 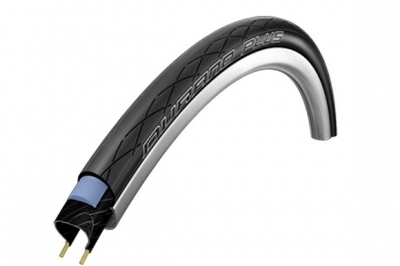 - The right choice for high mileage purposes including highest puncture protection. No other racing tire lasts longer, no one is that safe: supposed to make 6.500 miles under normal conditions. At the same time the Dual Compound offers great grip for training on wet winter roads. With provenSmartGuard protection belt. Specifications: maximum pressure 115psi/8.0bar, DualCompound, SmartGuard puncture protection liner, 11oz/315 grams light.